These past couple of months have been both exciting and exhausting for my husband, Kevin, and me. 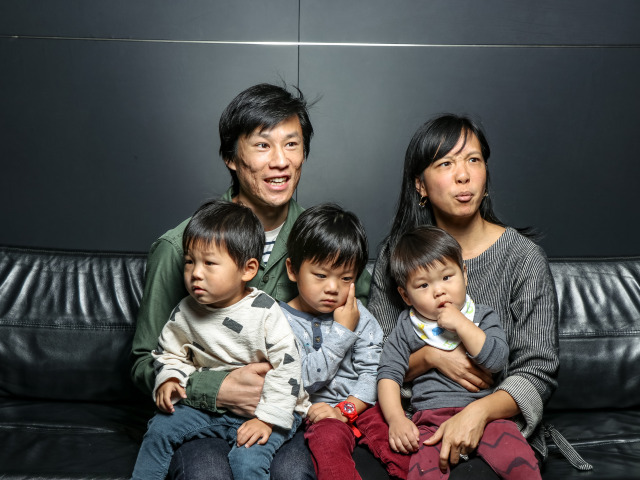 Traveling to Korea to adopt and going from raising 2 to 3 boys has been quite a transition for us. Schedules and added responsibilities in the home brought out some ugly parts of us we did not want to see. As we talked, we realized we had to let go of many things in our lives but one thing we would not let go of was our marriage. During any time of major transition in a family, it takes time to reach a new norm. A marriage most likely does not remain the same. It either weakens or strengthens. The good news is whatever you are going through, even if it is trauma, your marriage can grow and strengthen from it. We demand perfection in ourselves and others these days. The word’s standards are high and harsh. Rest in God’s grace (Heb. 4:10) and simplify expectations for yourself and for your spouse. We needed room in our marriage and family to breathe. That meant if the boys skipped a bath, I didn’t get to homeschool a day, or we had to miss important parties and showers, we had to let go. It seems like we have more roles than we’ve ever had in our culture. It is important to simplify and know your roles so you can have perspective and focus in the midst of chaos. In a Christian marriage, we believe men are head of the household (Eph. 5:23) and women are helpers (Eph 5:22). The roles are different but equally important. We can’t have two CEO’s of a company. As the head, men are designed to provide (I Tim. 5:8) and to protect (I Pet. 3:7) . Kevin needed to be able to focus on his job to provide and be given the room and respect to take care of me and the children. As his helper, I needed to nurture and to support. I needed to manage the home and children (Prov. 31:27-28) during the day so he could focus on his job and not worry. When he came home, I needed to let him care for me and the children by stepping back and respecting him (I Pet. 3:1) and his decisions rather than boss him around. When Kevin and I were able to walk in the God-given roles He gave us, it brought peace in our marriage and order in our home. When life is chaotic, it is tempting to stop looking up and to start looking inward. The result? Finger-pointing, blame, fights and misery. There are times Kevin and I have been angry at each other and tempted not to go to church. However, the second we walk in church and are surrounded by Christ-followers and filled by God’s Word, love and forgiveness rush into our hearts and we walk out hand in hand. Everything needs to center around worship, not vice versa (Josh. 24:14-15). It was important for our marriage and for our children to see while life changes like the shifting of the sand, worshipping God is our foundation. It seems like in our current day, people are in transition more than ever. Simplifying our expectations and living out our God given roles while worshipping Him strengthens marriages and families. Is your marriage strengthening or weakening?